Start off your visit on the 16th (Sun): explore the ancient world of Temple of Olympian Zeus and then steep yourself in history at Acropolis of Athens. Keep things going the next day: get engrossed in the history at National Archaeological Museum, then wander the streets of Plaka, and then get engrossed in the history at Acropolis Museum. For maps, traveler tips, where to stay, and other tourist information, you can read our Athens day trip planning site . Seattle, USA to Athens is an approximately 17.5-hour flight. You can also do a combination of shuttle and flight; or do a combination of flight and train. The time zone difference when traveling from Seattle to Athens is 10 hours. Plan for a bit warmer temperatures traveling from Seattle in June, with highs in Athens at 86°F and lows at 70°F. Finish up your sightseeing early on the 17th (Mon) so you can travel to Naxos. Start off your visit on the 18th (Tue): enjoy the sand and surf at Agios Prokopios Beach, examine the collection at Theatrical Museum Iakovos Kampanellis, delve into the distant past at Portara, then explore the ancient world of Temple of Apollo, then wander the streets of Old Town, and finally look for gifts at Ta Axotica Gift Shop. To see reviews, other places to visit, photos, and more tourist information, read Naxos trip itinerary builder site . Traveling by combination of subway and flight from Athens to Naxos takes 2.5 hours. Alternatively, you can ride a ferry; or do a combination of flight and ferry. June in Naxos sees daily highs of 82°F and lows of 69°F at night. Cap off your sightseeing on the 18th (Tue) early enough to catch the ferry to Fira. Start off your visit on the 19th (Wed): stroll through Hiking Trail Fira - Oia, then don't miss a visit to Sunset in Oia, and then explore the activities along Amoudi Bay. Keep things going the next day: see the interesting displays at Museum of Prehistoric Thera, then learn about winemaking at Santo Winery, and then indulge your senses at some of the top wineries in the area. To see reviews, other places to visit, photos, and more tourist information, use the Fira trip maker site . Traveling by ferry from Naxos to Fira takes 1.5 hours. Alternatively, you can fly. In June in Fira, expect temperatures between 82°F during the day and 70°F at night. Finish up your sightseeing early on the 20th (Thu) so you can catch the ferry to Rethymnon. 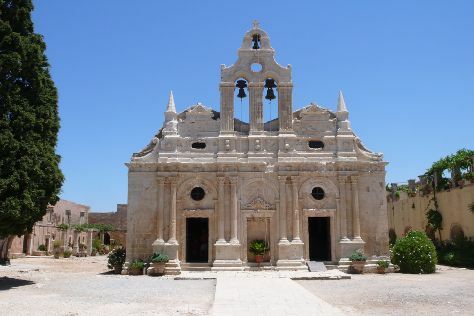 Kick off your visit on the 21st (Fri): contemplate the long history of The Venetian Fortezza, get some thrills out on the water with a waterskiing or jet-skiing adventure, and then take in the spiritual surroundings of Monastery of Arkadi. To find other places to visit, photos, reviews, and other tourist information, you can read our Rethymnon itinerary builder tool . You can ride a ferry from Fira to Rethymnon in 2.5 hours. Other options are to drive; or do a combination of ferry and taxi. Expect a daytime high around 84°F in June, and nighttime lows around 67°F. Wrap up your sightseeing on the 21st (Fri) to allow time to drive to Hersonissos. Kick off your visit on the 22nd (Sat): contemplate the waterfront views at Lake Voulismeni, meet the residents at Aquaworld Aquarium & Reptile Rescue Centre, then meet the residents at Cretaquarium - Thalassocosmos, and finally take an in-depth tour of Heraklion Archaeological Museum. Get ready for a full day of sightseeing on the 23rd (Sun): look for gifts at Luxurious Furs and then enjoy the sand and surf at Stalis Beach. To see other places to visit, reviews, ratings, and other tourist information, go to the Hersonissos online attractions planner . Traveling by car from Rethymnon to Hersonissos takes 1.5 hours. Alternatively, you can do a combination of shuttle and bus; or take a bus. In June, daily temperatures in Hersonissos can reach 82°F, while at night they dip to 64°F. Wrap up your sightseeing on the 23rd (Sun) early enough to travel back home.